We have many points of pride here at Silke. We’re proud of the high quality service we provide to our clients, we’re prouder still of the cutting edge kitchens our talented design staff create, and we’re proud of the fact that we offer all we do at incredibly competitive prices. One thing we’re especially proud of, however, is that we are ultimately a small, family-oriented business as opposed to a retail chain; just like Deco Glaze. Today, we’d like to take some time to shine the light on this fellow family business. Not only do they offer top of the range products, working with some of the biggest names in the kitchen business, but Deco Glaze do so after having worked hard at what they do for many years. Founded in 2000 by husband and wife duo Jeff and Holly Rhodes, Deco Glaze stands as one of the largest and most trusted providers of colour coated glass splashbacks in Britain. In fact, they’re one of thee first companies to provide bespoke colour coated glass splashbacks, period, coming into being when the Rhodes noticed a niche in the market. Though it’s total staff count may be small, Deco Glaze maintains a steady lead in the glass splashback market, staying ahead of the game via product innovation, production backed by the latest technology, and top-of-the-line installation work. Having impeccable customer service certainly helps, too! Their product range is fairly expansive, too. 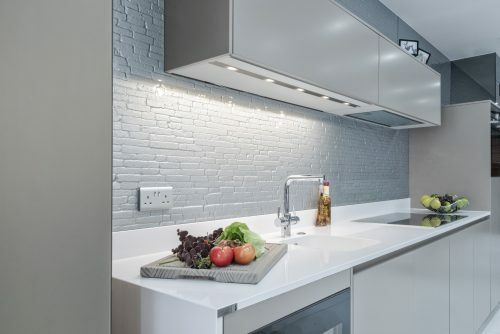 Their Deco Glaze Classic range of glass splashbacks comes recommended, sporting incredible durability that is resistant to damage inflicted by stains, heat, water, acid, and even fire (and it can be toughened further at the request of the customer). The range comes in a total of three thicknesses- 6mm, 10mm, or 19mm- and in a range of 48 colours. If you’re looking for something a little more fancy, however, they’ve got you covered there too. DecoKiln is a range of intricately textured splashbacks that will add a little depth to any kitchen; the DecoLuxe range features a selection of sparkling metallic colours, such as Platinum, Myrrh, or Russet; their Fusion range features glass splashbacks with immaculate 3D patterning, which can also be backlit; they even offer a range of reflective surface splashbacks under their DecoMirror range; and finally, if you’re on a bit of a tighter budget, they offer twelve of their most popular colours as part of the DecoColour range of cost-reduced glass splashbacks. As mentioned above, Silke has a close working partnership with Deco Glaze; almost all of the glass used in our products and at our showroom is provided by the company, so you can rest assure that our recommendation of the company and their services comes from experience working with them. And if you need any further convincing, their official website includes a testimonials page, where comments from numerous happy customers of theirs are proudly displayed for the public to peruse. It’s often thought that the best services or products come from recognisable brand names, but companies like Deco Glaze are only too happy to buck the trend, proving that sometimes family-owned business is the best business!